A few weeks ago I shared an elearning example I created for an elearning workshop. Many of you requested a template based on the example so here it is. There’s a PowerPoint version and one for Articulate Storyline 2 that offers a lot more interactivity. One of the challenges when using a pre-defined template is that it tends to look good with real content. And then when you get the blank template it doesn’t seem to feel the same. That’s OK. Just add your own content. And don’t be afraid to move things around to make them work for your needs. You’ll also notice that there’s a big difference between a PowerPoint-based template and one created in Articulate Storyline. PowerPoint is generally a linear presentation product. You can add hyperlinks to create some interactions but you do a hit a ceiling with what you can create. For example, generally there are three types of interactions: click, hover, and drag. In PowerPoint you’re mostly limited to click interactions. You can still create a lot of interactive content, but you do have that constraint. And each interactive element potentially increases your file size significantly. In Storyline, I can create one slide with hovers for each module. In PowerPoint to create a similar effect would require a slide for each module. As I add more interactive slides, the slide content increases dramatically in PowerPoint. However in Storyline, I’m still able to use the same slide. In the Storyline version of the template, I can leverage variables to track what the user does. That lets me mark courses complete and modify where the learner goes after all courses are complete. That’s something not possible in PowerPoint. Here’s an example of the free PowerPoint template. I added some placeholder content. 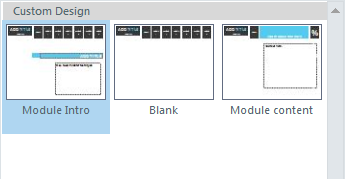 In this template, I created a master slide for each module; and each module contains seven layouts. The reason I created seven different masters is so that each layout would have the selected state for the particular module. You need to go into the master layouts and create hyperlinks to the appropriate slides. Switching layouts is pretty simple. Just select a new layout. Also, for the quick knowledge check slides, you’ll need to add hyperlinks at the slide level. 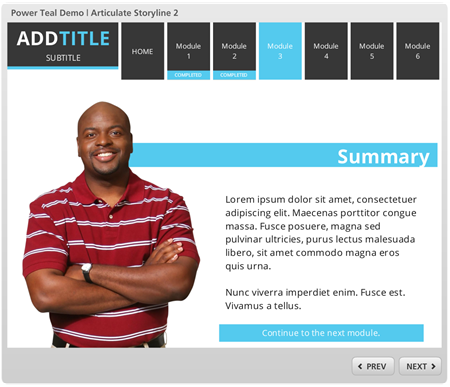 Here’s an example of the free elearning template created in Articulate Storyline. This one was created in Storyline 2. 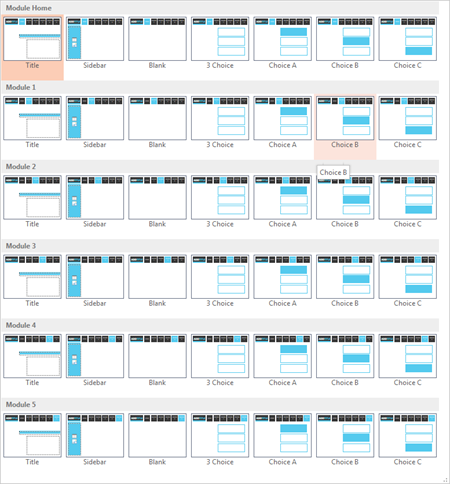 The Storyline template only uses three layouts. As you can see that’s a big difference compared to PowerPoint. It also gets to leverage the slide layers and I used variables to track the learner’s progress and navigation. This lets me mark modules complete and also change the button to represent the appropriate module being visited. That’s why I don’t need to create all of the same layouts that I need in PowerPoint. If you have any questions about using them let me know. In an upcoming post, I’ll do a couple of quick tutorials to show how to get the templates working. 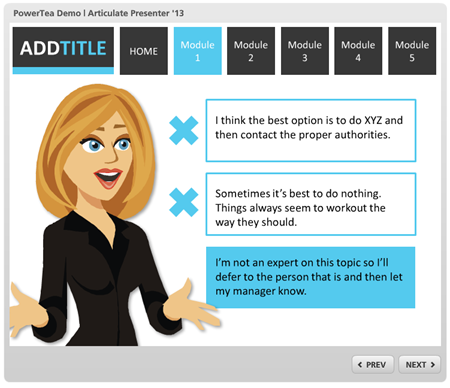 The template looks good, but can the Storyline 2 version be used with the original version of Storyline? Government budgets being what they are, it’s highly unlikely that we’ll be able to purchase the newer version in this bienium, but it would be nice to still be able to get access to new templates for Storyline. I did download the PP version that will work for Presenter or import to Storyline 1, but having the condensed verison for Storyline would be nice. Thanks! I planned on doing a tutorial on how to use the variables so I’ll build it in Storyline 1. I’ll share the file and you’ll get a template from it…and learn about variables, too. I don’t have Storyline 2 yet either, so the template in Storyline 1 would be useful to me as well. I have been following you and Articulate greatness for a few years now. I am in an Instructional Design degree program and find myself stuck on a process to create e-learning. Can you (or have you?) share(d) how you go about creating your training designs? Example content outline, story creation, etc. @Wenly: essentially the blog covers a broad range of those topics but not in a systematic way. You could start with these resources in the community: free ebooks and the 101 series. I am new to elearning design. I have taught for 18 years, have created content for courses, and am now branching into the development phase. This blog has been the most useful that I have seen! I am going to look at the free ebook and 101 series. Are they any other resources to help get me started? I have created 2 courses so far, and they are fine, but I want to truly understand the process and create professional courses. @Aimi: I’d also participate in an occasional elearning challenge in the community. It’s a great way to practice little things to enhance your skills and production techniques and it’s a great way to network with others.